Advertising people are always looking for harbingers of the next, something that will point those of us smart enough to see it – or perhaps just lucky enough – towards what is coming up over the horizon. Not just the latest poptune about to go global or the hottest celebrity about to blow up – although to be sure, we’re always looking for those too. But the real gold is that new way of living that will dominate our lives in ways we cannot even imagine – for us, for our children and, if we’re lucky, our children’s children. To say that at the beginning of the twentieth century the smart money would have been on the automobile may appear obvious to those of us with the perspective of a hundred years of car culture. But it is part of the special genius of Earl Swift’s “The Big Roads” to make one realize just how colossal an impact the automobile had, how different America was in the early days of the twentieth century, and how much the world we live in now was the very pipiest of pipedreams a hundred years ago. Swift begins his tale when the automobile offered America two simple propositions that a system of interstates would bring to life. First, that mechanized vehicles could get food from farms to cities much more efficiently than ever before. This in turn meant that farmers (which represented the driving force in the American economy) would be wealthier, and that people in America’s cities (the fastest growing part of the country) would be healthier. Historically we call that a win-win. And the second proposition? That a system of roads would inevitably feed America’s insatiable appetite for movement. When Ford made the automobile affordable to everyone, it meant that almost any moron with a couple of hundred bucks could light out for the horizon in ways he never could before. And for a nation suddenly without a frontier, that was a powerful prospect indeed. And from these two simple ideas (later joined by a third, the military’s observation that highways would make it a helluva lot easier to get troops around the country if we were ever invaded by a foreign power), grew those massive arteries that funnel us into every major city in America and that provide us with the food and toys and clothes that make our infrastructure – even in its current dilapidated and decaying state – the marvel of nations the world over. Not only does Swift do a terrific job of tracking and bringing to life the heroes and villains and absolute Class A morons who are endemic in any project of this magnitude, but he also does not neglect the curious Heisenberg component of the story; that there was a strange tipping point at which highways suddenly flipped from being servants of cities to being their adversaries. As a result, Swift has crafted a really fascinating tale of America’s growth throughout the 20th century in a context and perspective that is refreshing and compelling. But here’s why the book is more than just a book about highways. “The Big Roads” is filled with stories of people who thought big and for whom the future was the vast canvas upon which they would paint their accomplishments – accomplishments that were not going to be measured in quarterly shareholder gains, or in how much VC capital they raised, or by the billions they got when they went public. But measured instead against edifices as magnificent and timeless as the Roman aqueducts and the cathedrals of Europe and the pyramids of Giza – projects that have stood for a thousand years. And where are these people today? Now I understand if this is an odd question for someone in advertising – that most fleeting, superficial and insubstantial of creative exercises – to ask. But after reading “The Big Roads” one can’t but help admire the palpable sense of “what if”, of the possible, of the “what might be” that drove almost everyone in the book. A sense that is combined with the revolutionary idea that the future didn’t consist simply of a bulldozed past, but of one that uses what exists – current roads, trails, thinking, whatever. Because the point wasn’t to just make something new upon which you could slap your name, but to make something monumental. Was there hucksterism? Sure. Were things ever quite as perfect as advertised? No. But did that stop them from pressing on, oars against the current? No. So press on. Because it’s time to make something great. 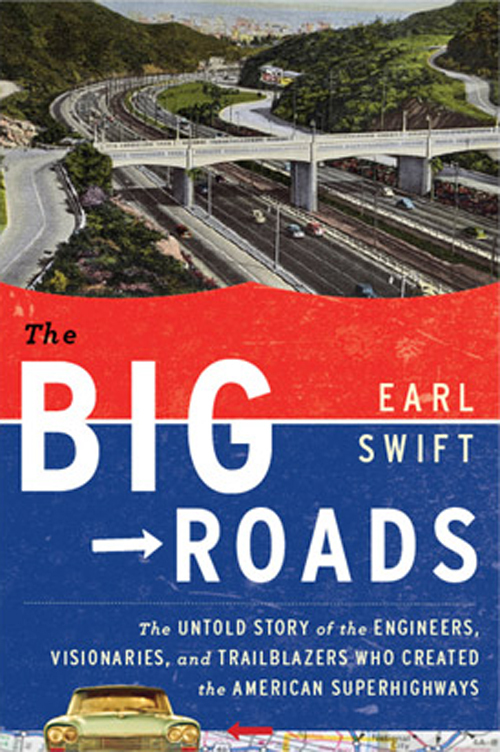 The Big Roads by Earl Swift was published by Wiley on 06/09/11 – order it from Amazon here or from Barnes & Noble here – or pick it up at your local bookseller (find one here). Great review, and an insightful analogy!